About ten years ago I had my first one-on-one session with my caseworker, who's a real person with a name and an office but I don't want to get her in trouble. She has her own set of problems. She has a degree in social work. She's thirty-five years old and can't keep a boyfriend. Ten years ago she was twenty-five and just out of college and she was swamped with collecting the clients assigned to her as part of the federal government's brand-new Survivor Retention Program. What happened was a policeman came to the front door of the house where I worked back then. Ten years ago, I was twenty-three years old, and this was still my first posting because I still worked really hard. I didn't know any better. The yards around the house were always wet dark green and clipped so smooth they rolled out soft and perfect as a green mink coat. Nothing inside the house ever looked depreciated. When you're twenty-three, you think you can keep up this level of performance forever. A ways back from the policeman at the front door were two more police and the caseworker standing in the driveway by a police car. You can't understand how good my work felt up to the moment I opened that door. My whole life growing up, I'd been working toward this, toward baptism and getting placed in a job cleaning houses in the wicked outside world. When the people I worked for had sent the church a donation for my first month's work, I was beaming. I really believed I was helping create Heaven on Earth. No matter how people stared at me, I wore the mandatory church costume everywhere, the hat, the baggy trousers with no pockets. The long-sleeved white shirt. No matter how hot it got, I wore the brown coat if I went out in public, no matter what silly things people said to me. "How come you can wear shirts with buttons?" somebody at the hardware store would want to know. "Do you have to wear special secret undergarments?" I think they were talking about Mormons. "Isn't it against your religion to live outside your colony?" That sounds more like the Mennonites. "I've never met a Hutterite before." crushing all of the Sodom and Gomorrah seething around you in the Valley Plaza Shopping Center. You were everyone's savior, whether they knew it or not. On a sweltering day in your heavy blah-colored wool, you were a martyr burning at the stake. It felt even more wonderful to meet someone dressed the same as you. The brown pants or the brown dress, we all wore the same lumpy brown potato shoes. The two of you would come together in a quiet little pocket of conversation. There were so few things we were allowed to say to each other in the outside world. You could only say three or four things so you wanted to start slow and not hurry a word. Shopping was the only reason you were allowed out in public, and this was only if you were trusted with money. May you be of complete service in your lifetime. Praise and glory to the Lord for this day through which we labor. May our efforts bring all those around us to Heaven. May you die with all your work complete. arithmetic, getting out stains, and tolerance. Rules for the outside world included you had to write weekly letters of confession back to the elders in the church district. You had to refrain from eating candy. Drinking and smoking were forbidden. Present a clean and orderly appearance at all times. You could not indulge in broadcast forms of entertainment. You could not participate in sexual relations. "But they which shall be accounted worthy ... neither marry, nor are given in marriage." Elders of the Creedish church made celibacy sound as easy as choosing not to play baseball. The other rules just went on and on. God forbid you should ever dance. Or eat refined sugar. Or sing. If the members of the church district colony felt summoned by God, rejoice. When the apocalypse was imminent, celebrate, and all Creedish must deliver themselves unto God, amen. And you had to follow. It didn't matter how far away. It didn't matter how long you'd been working outside the district colony. Since listening to broadcast communication was a no-no, it might take years for all church members to find out about the Deliverance. Church doctrine named it that. The Deliverance. The flight to Egypt. The flight out of Egypt. People are all the time running from one place to another in the Bible. You might not find out for years, but the moment you found out, you had to find a gun, drink some poison, drown, hang, slash, or jump. You had to deliver yourself to Heaven. This is why there were three police and the caseworker here to collect me. The policeman said, "This isn't going to be easy for you to hear," and I knew I'd been left behind. It was the apocalypse, the Deliverance, and despite all my work and all the money I'd earned toward our plan, Heaven on Earth just wasn't going to happen. Before I could think, the caseworker stepped forward and said, "We know what you've been programmed to do at this point. We're prepared to hold you for observation to prevent that." Back when the church district colony first decreed the Deliverance, there were around fifteen hundred church district members scattered all over the country in job postings. A week later, there would be six hundred. A year later, four hundred. Since then, even a couple of caseworkers have killed themselves. The government found me and most of the other survivors by our letters of confession we sent back to the church district colony every month. We didn't know we were writing and sending our wages to church elders who were already dead and in Heaven. We couldn't know that caseworkers were reading our tally every month of how many times we swore or had impure thoughts. Now there was nothing I could tell the caseworker that she didn't already know. Ten years have passed, and you never see surviving church members together. The survivors who see each other now, there's nothing left between us except embarrassment and disgust. We've failed in our ultimate sacrament. Our shame is for ourselves. Our disgust is for each other. The survivors who still wear church costume do it to brag about their pain. Sackcloth and ashes. They couldn't save themselves. They were weak. The rules are all gone, and it doesn't matter. We're all going overnight express delivery straight to Hell. So I took the trip downtown in the back of a police car, and sitting beside me, the caseworker said, "You were the innocent victim of a terrible oppressive cult, but we're here to help you get back on your feet." The minutes were already taking me farther and farther away from what I should've done. The caseworker said, "I understand you have a problem with masturbation. Would you like to talk about it?" Every minute made it harder to do what I'd promised at my baptism. Shoot, cut, choke, bleed, or jump. The world was passing by so fast outside the car my eyes went goofy. The caseworker said, "Your life has been a miserable nightmare up to now, but you're going to be okay. Are you hearing me? Be patient, and you'll be just fine." This was almost ten years ago, and I'm still waiting. The easy thing to do was give her the benefit of the doubt. Jump ahead ten years, and not much has changed. Ten years of therapy, and I'm still in about the same place. Every member of the Creedish Cult learns how to be a servant for the human race--most of them are butlers and maids--and fear most human pleasures. They await a sign from God to tell them to deliver themselves unto Him; that is, they must commit suicide. Tender Branson, the last surviving member of the Creedish Death Cult, has commandeered a Boeing 747, in order to tell his story. 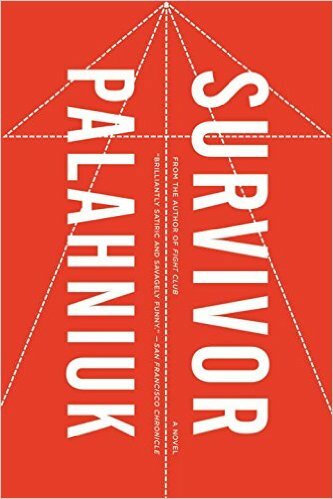 Palahniuk's brilliant gift for satire and humour, coupled with his knack for crafting mesmerizing sentences never fails to amaze.